Now days we are use to seeing what a major villain look's like or learning spoilers to upcoming movies by way of new toy releases or concept art. This story isn't any different. Thanks to AC Toys we now have our first look at Devastator fully combined and a fully body scale of the Fallen. Both of the designs are the concept art for the film and gives Transformers fans something new to salavate over besides the teaser trailer. Devastator is a Constructicon who is made up of 7 or even 8 different Transformers. Transformerphiles have already begun searching and defining each of Devastator's body parts to find it's counter (real life) alt mode or vehicle mode. From what I can tell there is a dump truck, crane, bulldozer, excavator, a loader, a dragline excavator or crane, a mixer and a some type of heavy drill. As we previously saw in the trailer the excavator alone was massive, so imagine when you combine 7 other massive earth-movers. 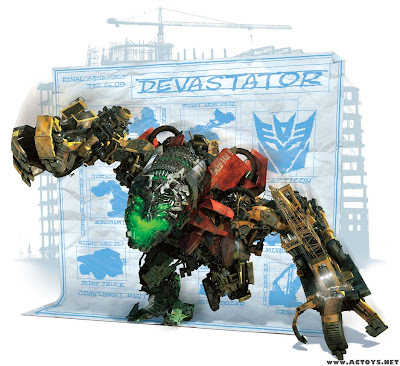 The released image clearly shows that Devastator is ape-like in his design. His arms hang down to the floor and he has a hunched over look, but regardless Devastator is gonne be gigantic!